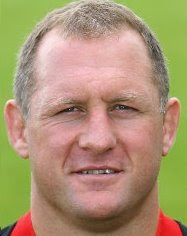 I felt very sorry for Saracens yesterday after their narrow defeat to Munster in the Heineken Cup. Not so much for the club itself - although they are my local professional team I can hardly call myself a passionate fan - no, the guy I feel sorry for is Richard Hill who retires at the end of the season having played most of this year on virtually one leg and who, I feel, really deserves to out with a bang. There have been several entirely deserved tributes to Hilda in the press recently so I'll keep this short. What I would say, however is that, as a player, he's probably the best pound for pound forward England have ever produced. In trying to get into a Salisbury nightclub his mates decided to try to blag their way in as famous rugby players. "I'm Rob Howley," said one and was waved through. "Martin Johnson" said the other and in he went too. "Richard Hill" said Hilda, to which the doorman replied "Sorry mate, never heard of that name. Still, if you’re with Rob and Martin , I suppose you can go in." Damned right you need foot soldiers, Hilda, and as foot soldiers go you were simply the best.